A lodestone, or loadstone, is a naturally magnetised piece of the mineral Magnetite. They are naturally-occurring magnets, which can attract iron. The property of magnetism was first discovered in antiquity through lodestones. Pieces of lodestone, suspended so they could turn, were the first magnetic compasses, and their importance to early navigation is indicated by the name lodestone, which in Middle English means 'course stone' or 'leading stone',from the now-obsolete meaning of lode as ‘journey, way’. Properties of Magnetite are it may be useful if feeling sluggish, and it is said to be extremely useful for sport injuries as it may relieve aches and pains in muscles. 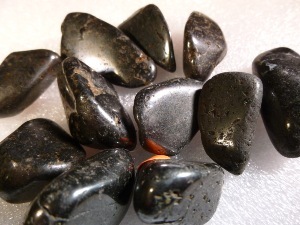 Psychologically, Magnetite is said to used to alleviate negative emotions such as fear, anger, grief. It's considered to point out how to remove yourself from detrimental situations and promote objectivity. This stone is said to balance the intellect with emotions to bring inner stability. Healing Magnetite is said to be beneficial for asthma, blood and the circulatory system, skin and hair. Also said to be anti-flammatory, healing muscle strains and cramps. Lodestone Magnetite tumbled to a smooth finish, an ideal pocket size stone, small enough to carry around with you. Tumble Stones can also be placed around the home for their energies or can just be nice decorative items. 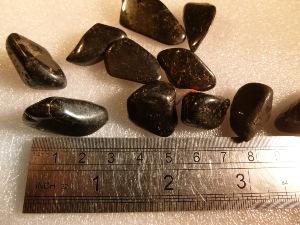 Lodestone Magnetite crystal gemstones of varying sizes selected specially for your order.